Sir Edward Heath was the target of ‘contemptible’ blackmailers who threatened to out the then Prime Minister as gay, The Mail on Sunday can reveal. Papers to be kept top-secret until 2042 but obtained by this newspaper under Freedom of Information laws reveal how Heath was ‘plagued’ by what a Foreign Office official called ‘blackmailing and abusive letters’. Such was the concern over the blackmail plot that it prompted talks at the highest level, including meetings at No 10. Rumours about the unmarried Heath’s private life dogged him throughout his career. Last year, police opened an inquiry into unsubstantiated allegations of historic child abuse against him, prompting fury from friends. The blackmailers’ plot came about after a woman belonging to a bizarre cult, The Institute for Personal Development, threw ink over Heath in Brussels in January 1972, an incident that was front-page news at the time. German-born Karen Cooper, who was living in London and whose real name was Marie-Louise Kwiatkowski, was protesting over a council’s refusal to allow the cult to build a conference hall in Covent Garden. She and the other members held Mr Heath responsible. 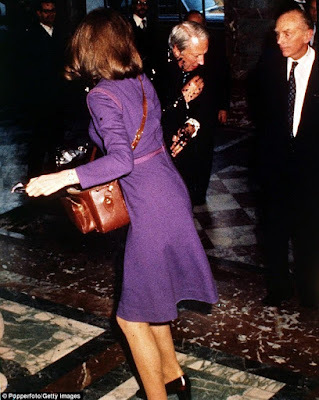 She was charged in Brussels with assaulting a head of state, but a series of letters sent in 1972 by her friend and future husband George Martin warned Heath what would happen if the charges were not dropped. Claiming that Cooper had shouted out ‘You damn homosexual’ during her attack – although this was unreported at the time in the extensive news coverage – Martin made a thinly veiled threat when he wrote that the cult would ‘bring the whole matter to an amicable end’ only if the case did not come to trial.